Roasted beets and fresh cherries are baked in a tender--and shockingly pink--muffin. Over the weekend I realized the cherry trees in my neck of the world are ready for harvest. My first clue was walking the dogs along a sidewalk covered with what looked like . . . well, cherries like I get at the store. I could not pause to pick any fruit up like I did when encountering plums all over the ground because when you're holding leashes to a 16 pound, a 42 pound, and a 66 pound dog your hands are already full. Yesterday I saw a dad holding his son steady on a ladder while the kid picked cherries from their tree. [At least I assumed it was theirs. Who am I to comment on foraged fruit?] The sight reminded me that I'd been sitting on a fresh cherry recipe for nearly a year. Since I like to share muffin recipes on Mondays [and I've been spending time updating my Visual Recipe Index by Ingredient as well as adding a grilling section to my drop down menu recipe index, not plotting out the month's worth of posts] I figure today is as good a time as any. 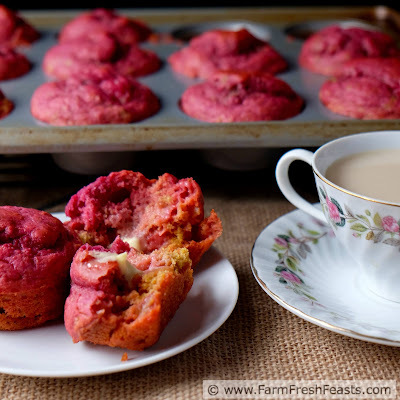 Grab a cup of tea with these muffins--even though they have beets in them, they are delicate enough thanks to the yogurt. My kids ate them warm for breakfast and room temp for an after school snack with peanut butter and/or Nutella. Any method to get beets from the farm share into the family is a good method in my book. For more recipes using beets, please see my Beet Recipes Collection. For more recipes using cherries, many of them dried, please see my Cherry Recipes Collection. 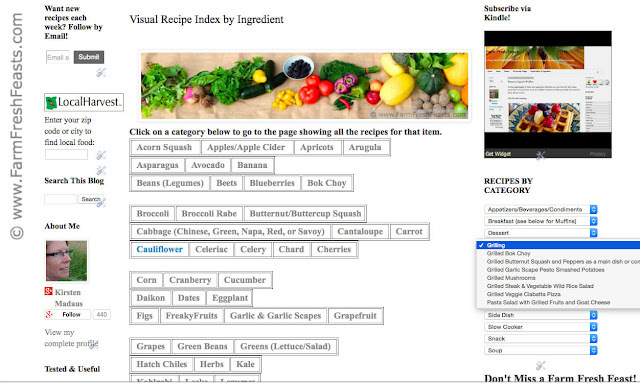 These collections are part of the Visual Recipe Index by Ingredient. I've got a Fruit board on Pinterest where I gather interesting recipes, and of course I'm sharing other bloggers' successes and my epic failures over on my FB page. Preheat oven to 400 degrees Fahrenheit. Spray a 12 hole muffin pan with vegetable oil spray or line with muffin cups. Set aside. In a blender, combine first 6 ingredients (beets through egg). Blend until thoroughly mixed. I use my Vitamix (Amazon affiliate link) . Pour into a large bowl, and dump the dry ingredients on top (flour through baking powder). Stir until nearly combined, then add cherries and stir a bit more. Scoop** into prepared muffin pan. Bake for 15 minutes. Let muffins rest in pan for 5 more minutes before transferring to a cooling rack to finish. I don't have cherry trees in my neighborhood, but did note cherries on sale this week! 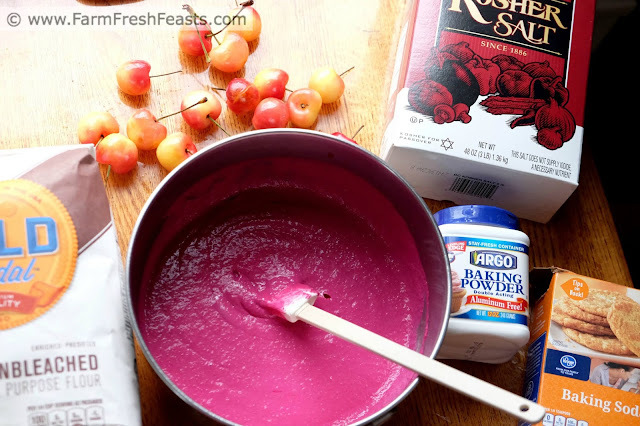 LOVE the brilliant hue on these Kirsten - so smart to pair cherries and beets. I hadn't seen that done before. It's not that I'm hiding these beets, not exactly . . . 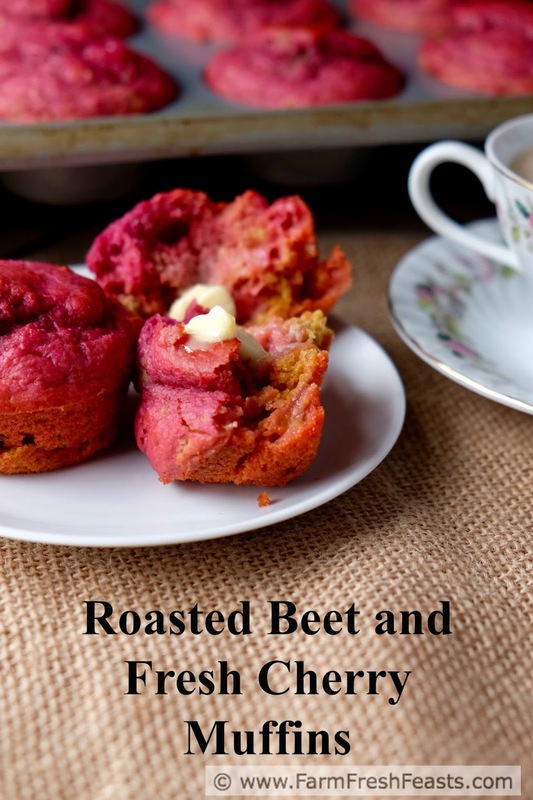 I still need to try your chocolate beet muffins! Cherries are so expensive in my area, but we all love them. I will have to try this! You could always jump on over to my Chocolate Beet Brownies! One of the benefits of eating seasonally is getting a bit better deal on foods that are in season--even if they are pricey to begin with. I love the addition of yogurt and I am all for foraged fruit. I'm blown away by what grows in our fair city. 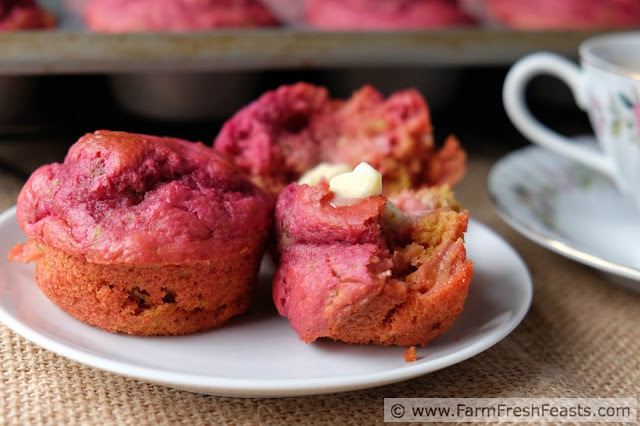 I love the color the beets add to the muffin, I bet they add a delicious sweetness too! It's so lovely to see all the beautiful hues nature provides. I can imagine how this tastes like! I love the color as well. It's a sweet & fruity bite, with a bit of tang from the yogurt.